Yogurt Marinated Grilled Leg of Lamb is so elegant to serve to your family and friends. Just one Leg of Lamb can feed a crowd of family and friends. This grilled leg of lamb is so easy to make and so delicious to eat. Butterflying a leg of lamb helps it to cook faster and more evenly. You can have your butcher do it, but it’s not hard to do yourself, and the process leaves you with a lamb bone to use for making stock or flavoring soup. In a medium-size bowl, combine yogurt, lemon juice, lime juice, rosemary leaves, garlic, salt, and pepper. Place lamb into a deep baking pan; pour yogurt marinade over the lamb. Cover and refrigerate at least overnight or up to 3 days. Remove lamb from refrigerator and allow to come to room temperature before proceeding. Scrape the marinade off the lamb, wipe the meat with paper towels, and season generously with salt and pepper. Preheat Barbecue and brush the grill with oil to keep the lamb from sticking. Grill lamb approximately 10 to 15 minutes on each side for rare or until meat thermometer registers an internal temperature of 120 degrees F. to 130 degrees F. or desired temperature (see below). Remove lamb from grill and transfer onto a cutting board and cover with aluminum foil; let stand 15 minutes before carving. During this time the meat continues to cook (meat temperature will rise 5 to 10 degrees after it is removed from the oven). To serve, transfer sliced lamb onto a serving platter. Garnish with fresh sprigs of rosemary. 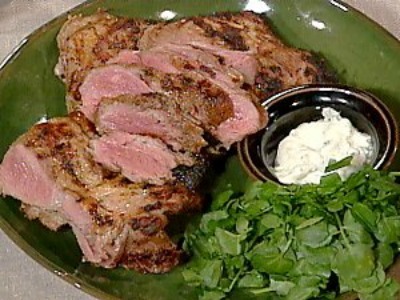 Source: Yogurt Marinated Grilled Leg of Lamb Recipe and photo by Emeril Lagasse from the Food Network television show The Essence of Emeril.